Asclepias tuberosa, Butterflyweed, sends out its radicle after a day of treatment in our natural plant hormone trials. Goal: Milkweed by seed without winter layering. We move a lot of milkweed in the Fall and early Winter for the savvy gardeners who know that so many native perennials require the winter to break plant dormancy. Many folks, however, miss that window, either because they are busy (I’m guilty of having a stack of seeds by the door waiting for fall planting, then the snow flies…), or because they simply don’t know that some plants need to be sown in the Fall. We start with identifying an issue we’d like to address that fits within our business mission: ‘Biodiversity through green business.’ In this case, it’s the need for reliable Spring-planting milkweed seed balls. We’ve do an extensive literature review. So, we found articles as far back of the 1930s and as recent as this decade. Brian and I read through them and identified several naturally occurring plant hormones and seed-coating treatments to try singly and in combination on the five species of milkweed that we can reliably find. Our research is driven by three things: hypotheses, the marketplace, and our environmental ethic. After we refine the question based on our review of earlier research, we develop hypotheses that build upon what we have learned. I prefer to use hypotheses to the softer ‘science questions’ approach to research. Having a clear statement to test helps focus experimental design on critical issues. Certainly observations often lead to more questions that can fuel further experimentation, but for me, the heart of any experiment it to test an idea, rather than free-form exploration. Next, we design affordable experiments to test those hypotheses as effectively and efficiently as possible. Sometimes, this means taking a shortcut or acting on a hunch. This deviates from peer-reviewed science some, since pure research does not seek commercial gain. So, I suppose Seed-Balls.com has that in common with the pharmaceutical and mining industries (egad! ); we are, after all, a business. Because both biodiversity and education are big parts of our mission, we’ll share the critical components of our experiments through our websites or our products. Our Milkweed Dormancy Experiment is really several different experiments, each designed to test narrow hypotheses like “Gibberellic acid and Saltpeter together will have a greater impact on Asclepias germination than either would alone.” If we verify the hypothesis confidently enough, we will be able to determine the method that works most effectively, and a quantification of how effective it is. From this we can determine if it’s commercially viable, and how many seeds need to be in each seed ball to ensure germination. An experimental tray in our lab with hundreds of tests of plant hormones on Asclepias species. Hi, I’m raising milkweed for a monarch organization and am having trouble germinating the incarnata. It was cold stratified for over a month and the tuberosa and syriaca, treated the same way, had excellent germination. The seed seller said the germination rate for this batch of incarnata was over 90% but a high percentage is in deep dormancy. What can I do to improve germination now? I considered putting the flats back in the frig and tricking it into a second winter, but I’m running out of time. Thanks for any suggestions. Asclepias incarnata can be very slow to germinate. I would indeed suggest just planting them outside. Some may take an extra year. One month may not be sufficient. Northern IL here. I have my new milkweed seed balls. Winter is knocking at the door. Is it too late to put them out? I sure hope not! Certainly, you can plant those seeds until January or so. Some you can plant later, too! This week, I’m trying Gibberellic acid on some assorted milkweed seeds I have. I’d like to know the results from your testing. 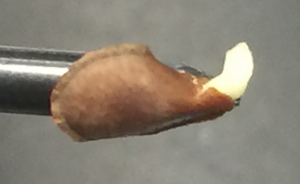 We have only had luck triggering germination early with plant hormones in Asclepias speciosa and Asclepias tuberosa. No luck with A syriaca, A fascicularis yet!